A visit to Jarvis Estate is an extraordinary journey into the world of exceptional winemaking. Visitors to the country’s first winery built entirely underground are offered an intimate glimpse into the meticulous steps that go into producing its lush Chardonnays, rich Cabernet Sauvignons and velvety Merlots, among others. Touring the 45,000 square foot cave is a unique experience and reveals how the Jarvis Estate approach to crafting world-class wines differs from what is found virtually anywhere else. The tour includes a visit to the Cuve Gallery, a collection of one dozen massive oak vessels assembled in the cave by French coopers and used to make certain the exceptional flavors developed in the estate vineyards are not compromised. The underground waterfall near the end of the tour ensures the steady cave temperatures of 61⁰F and humidity that are vital to the Jarvis Estate signature style of extended aging in new French oak barrels. Guests have the opportunity to enjoy the rewards of these painstaking efforts. The tour concludes with an intimate, seated experience in our Tasting Chamber where visitors will sample six Jarvis Estate and Reserve Collection wines. The Jarvis Cave is fronted by a several acre grassy meadow which was originally designed to be an ecological parking area. Rather than use asphalt, the area was finished with sand to support cars and planted to native grass. Jarvis has received its formal designation as Napa Green Certified. The winery is self sufficient in its water consumption by virtue of the two natural lakes on the estate, and all of the winery’s energy needs are met by an extensive solar array that powers every aspect of the winery. Tour our totally underground winery ending up in our intimate Tasting Room seated to taste six fantastic wines! 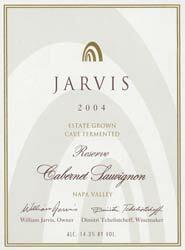 To join the wine club, visit www.jarviswines.com or call 707-255-5280. There are two ways to join the Inner Circle. One - Choose the wines and annual Inner Circle benefits start upon accumulation of wine purchases totaling $1300 or more within a calendar year. Two - Signup to receive 3 shipments per year of wine especially chosen for our members and Inner Circle benefits begin immediately. Jarvis is certified under the Napa Green Winery Program by the Napa County Department of Environmental Management (DEM) and the Association of Bay Area Government’s (ABAG) Green Business Program and completed all the regulatory components needed for environmental sustainability. These components included developing water and energy conservation methods, preventing pollution, and reducing solid waste. In addition to developing sustainable winery practices, this program is set to become the standard for the state of California. Jarvis is certified under the Napa Green Certified Land Program. Jarvis has created and implemented a customized farm plan with measured results that addressed all aspects of its property, vineyard land as well as non-farmed land, including practicing soil conservation, water conservation, stable drainage, riparian corridor enhancement, fisheries and wildlife habitat enhancement and long-term improvement and sustainability.